This truly amazing artifact is far older than mankind but was evidently made by someone. The question is: who? Discovered in the late 1990s by Zhilin Wang in a remote mountainous area in northwest China, the Lanzhou Stone is one of the most baffling out of place artefacts. The pear-shaped object is made of an extremely hard black mineral and measures approximately 3 by 3 inches. In some circles it’s been suggested that the stone might be a previously unknown type of meteorite. If this is the case, what purpose did the threaded metal bar inside the stone serve? 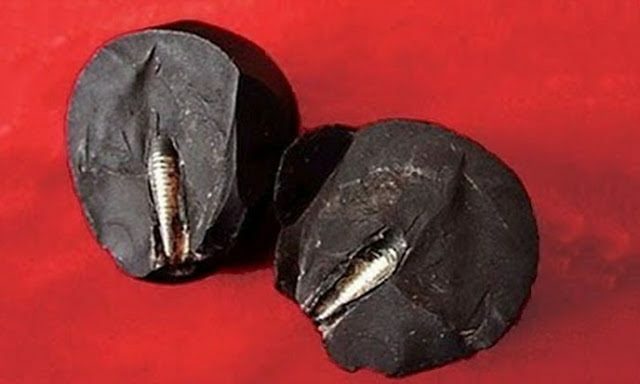 As you can see from the photo, embedded inside the Lanzhou stone is a metal piece that looks artificial. It is encased tightly and its position suggests it was deliberately placed there. “More than 10 geologists and global physicists from the National Land Resources Bureau of Gansu Province, Colored Metal Survey Bureau of Gansu Province, the Institute of Geology and Minerals Research of China Academy, Lanzhou Branch, and the School of Resources and Environment of Lanzhou College gathered to study the origin of this mysterious stone. The stone’s current location is unknown and analysis results have not been made public. But there are several interesting assumptions to be made. First of all, the metal rod was clearly fabricated and required a certain technological level to be manufactured. The unidentified black material could have been anything but the perspective of it being produced seems very likely. In this case, where did this technology come from? Was the stone a relic from a bygone age, one of the few objects left behind by an advanced civilization? Many alternative history proponents are convinced this is not only possible, but also likely. It’s an interesting scenario that brings up more questions. If there has been another technologically advanced civilization on Earth, there might have been more. What would the real history of our planet sound like then? A couple more practical questions would be: why aren’t they here anymore and will the same fate await us? On the other hand, if the Lanzhou Stone is in fact a meteorite, the plot thickens dramatically. If it’s been traveling through space, its journey probably started a while ago. It could potentially be billions of years old. Was it deliberately sent here? If so, why? Could it have contained life? Alas, we might never find the answers to these questions. Many have come to believe that critical evidence needed to support these theories is highly protected and the conspiracy stretches far and wide. Discoveries are suppressed, scientists are discredited and information is adulterated. The truth is either out there or much closer to us. Posted in O.O.PTagged Forbidden History, LanzhoucommentLeave a Comment on 2015: The Lanzhou Stone: Proof of Advanced Prehistoric or Extraterrestrial Civilization?